HI WELCOME TO MY WEBSITE. MY NAME IS PALLAPALLA. WHO IS PALLAPALLA? PallaPalla is in the Amizones Quartet, her element is Palaces. She is also the Princess from the Planet Pallas. She is the cousin of Queen Serena. she was reborn on earth and hates michelle because michelle is lezbo and tricking alex so she can date him. Alex is the boy PallaPalla loves. PallaPalla can transform into Pretty Soldeir Sailor Pallas. but because she is so strong she is never in the japanime. she is my favorite scout. Sailor Moon - aka Serrina Tuskino she is the princess of the moon and the universe. her boyfriend is Darrion. She is the coolest girl in the show because she has the best hair. her main attack is moon tiara magic. 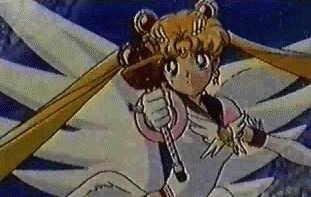 Later she turns into Eternal Sailor Moon and uses the Moon Spiel. Sailor Mercury - aka Amy Anderson she is the princess of mercury and loves Malachite. she is very smart--smarter than me!!!!!!!!! HER FAVORITE FOOD IS PIE AND HER BEST ATTACK IS SHINE AQUA STORM. sorry my caps button was held down. >Sailor Mars - aka Ray Heeno. She is mean! she has a name like a boy and thinks she is better than everyone else. she also has chad who likes her but since shes meean she tries to date darrion. her attacks are dumb. Sailor Venus<> - aka Mina Minako she is so pretty too. she is actually the princess of the moon until serrina becomes the princess. she fights oeople with a flahsmlight that comes out of her hand. sailor Jupiter - aka Lita she is ugly and i hate hert too. she is so mean like ray. everyone else hates her too thats why she wears a weird uniform. 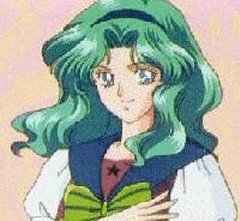 sailor neptune - aka Michelle Karson is stupid and gay. one website said her name was Kaiou but i thought that was ugly. it sounds like cow. her attack is called neptune crash cras.h. she likes her brother alex even tho they are brother and sister. she's icky. Sailor Uranus - aka Alex Stratos. He is so cool! isn't he cute? cuter than darrion! I like him even tho he turns into a girl. at least he's not gay like michelle is. his attack is called uranus crystal attack. The reason why akex is in a skirt in this picture is because when he becomes super sailor uranus, he gets a new outfit. sailor pluto - aka Severine Meow is very weird. she wears black like satanists at my school wear. she must be evil. her main attack in Pluto Devil Boom. Amy's hair is really brown, but she died it blue to look like a punk rocker. Ray is jealous of Serrina that is why Ray spanks her. Serrina actually slaps Reenie in the jap version. there weird. Lita can't take her hauir out of a piony tail or her head will fall off!! when michelle and alex found out they were scouts, they went on a cruise. YOU may have heard people call the scouts Seshi...but theyre wrtong! Its scouts! it doesn't even SOUND like Seshi!! There have been 7402424214 visitors to my site!!! This site was made by PallaPalla. My real name is Farrah Nobakah. I live on 6733 Creekwater Road in Springfield. I am 14 years old and I am a straight A+ student at Springfield High School. I am going to college next year because I am so smart!!!!!!! i have more stuff! a picture gallery all the images are not from my site but i asked permission join my ML join my chat room vote fgor me as best webpage!